Hey everyone! I'm so excited to write this post for you today! As you can probably tell my blog has undergone some changes over the past couple of days and I thought I'd do a post on it as I know a lot of people have decided to change their blogs and I've had a few tweets and messages asking me who did it and why I decided to have a change so I thought why not update you all. The past couple of months I have been really busy with my new job as you know and when I have had free time even though I have wanted to write a post I haven't been 100% happy with my blog enough to actually post and I think that has reflected in my content. Because of this I decided that it was about time I underwent a new blog design. I knew I didn't want something to pricey but I did want to pay enough for my blog to look neat and more professional. That's when I came across Pipdig. One of my favorite blogs ever is the gorgeous Corrie's from DizzyBrunette. 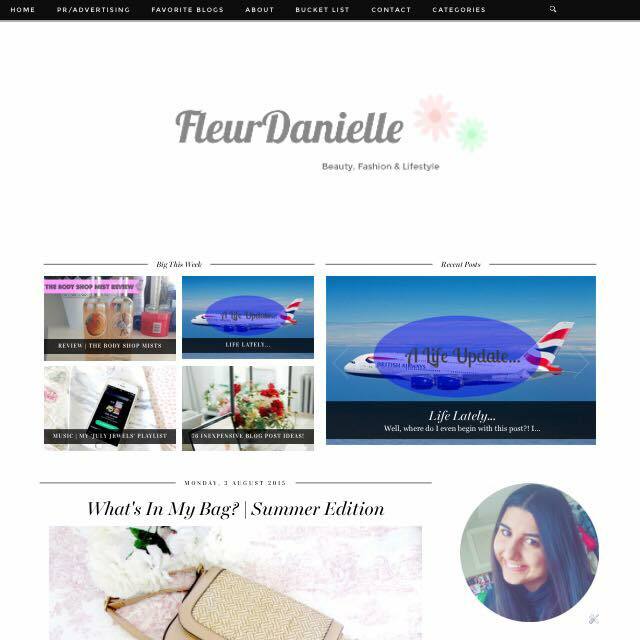 I absolutely love her blog design however as much as I wanted that design I didn't want it to seem like I was copying her so I decided to opt for a different one! The design I opted for is called 'Venture' and I absolutely love it! I just love the fact it has a scrolling image at the top of the page along with a 'Big This Week' section as I love the fact that readers can come on my blog and instantly see what posts are popular and what I've posted recently too. One thing I really did want for this design was a 'Read More' option as I just thought that would have made it a bit more sophisticated but it wasn't available, however after having it installed I can say I am extremely happy with how it looks and maybe in the future I'll add the read more section to my blog but right now I'm actually so happy with how it currently looks. In terms of the service I received I can honestly say I am very impressed. I bought the design from the Pipdig website on Sunday and by 3PM on Monday the design was already installed. It was super fast and super professional and I was actually working on my blog at the same time the design was being installed and it didn't affect what I was working on at all! The guys over at PIPDIG then emailed me to let me know that it was installed and included a few instructions for social media icons and pages I could add to my blog which was so easy to follow and within 10 minutes I had everything I needed on my blog. Overall I am super happy with my design and I feel more motivated than ever to work hard at my blog and produce better content for my blog. If you are looking for a new blog design then I would highly recommend pipdig. The design prices vary from £29 all the way to £49 which considering the way they look I really don't think is that bad at all! If you want your own custom made one or one to semi-custom one of their already premade ones then that is a slightly more expensive option but considering the amazing service you'll receive I think it's totally worth it! I am currently looking for someone to design a new header for me too so if you know of anyone please leave a comment below so I know who to contact! What do you think of my new design? Have you used Pipdig before or will you be using Pipdig in the future? I just had my new theme installed yesterday! It;s funny that I have found your blog and we both have the exact same design (I also got Venture) but our blogs still look very different, which is very nice! I love working with Pipdig, they are great!